It is a child’s first smile or laugh that keeps nurses at the children’s cancer ward going, standing by the parents’ side. “Suffering along with the parents of cancer survivors is inevitable for nurses who work at the Rainbow Ward, but we hang in there to help them make nice memories of their kid’s childhood,” says Angele Cuschieri, 33, as a little boy peeks into her office after treatment in expectation of sweets. Ms Cuschieri, who heads the ward at Mater Dei Hospital, ushers the boy in and tells him to pick a game from a box brimming with donated toys. “Our greatest satisfaction is when they come here but don’t want to leave because they’re having fun. There is no atmosphere of sadness hanging around. Children, aged up to 16, usually spend between six months and three years – even up to five years – receiving treatment. The survival rate is around 70 to 80 per cent and there are between 12 to 15 new cases every year. “One of the worst experiences is being told you will lose your children. We create a bond with the parents, especially when we see how much they love their children. We cannot help but feeling sad, but it is useless crying when we need to support them. “When families step into this ward, their life is turned upside down. They might have to stop working, or take it in turns, while siblings might have to move in with other relatives. Ms Cuschieri is also the vice chair of Puttinu Cares. Now a household name, the NGO was formed after consultant Victor Calvagna opened the Rainbow Ward some 12 years ago. Ms Cuschieri joined the Puttinu team two years later, after graduating as a nurse, and she has been at the Rainbow Ward ever since. Through the support group, the ward is equipped with a kitchenette, a laundry room and a Disney-themed playroom. The rooms have also been decorated with cartoon characters and equipped with video games and an extra bed for the parents to sleep over. The ward has its own teacher, cancer-survivor Sarah Craig, who liaises with the children’s schools as they try to keep up with their studies even when at hospital for treatment. A psychologist also attends the ward to help the diagnosed children, their siblings and parents express their emotions and deal with the painful experience. In December, Puttinu Cares forked out €60,000 to rent and equip six apartments in the UK when the support group ran out of space at the 18 residences it owns in Sutton. The funds also cover the electricity and water bills, council tax, appliances and haberdashery, among others. Some of these rented apartments will continue to be used in the coming months. 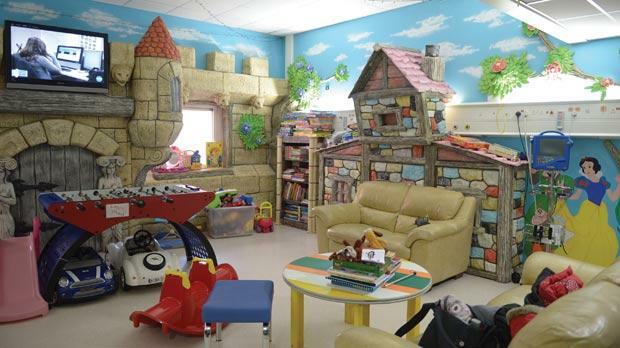 Puttinu Cares’ apartments are for families of children who need to receive treatment in the UK. But the apartments they own were not enough last month, as something of an emergency situation developed when a total of 30 families had to fly out to the UK. The 18 apartments are close to the Royal Marsden Hospital, however the support group hopes to one day be able to cater for families who need to go to hospitals in central London. Some cancer patients have to stay in the UK for months, even up to a year. One parti­cular survivor received care abroad 70 times in 11 years. The yearly football marathon in aid of Puttinu is still four months away, however those who in the meantime want to help out can log on www.puttinucares.org, call 7980 9778 or email info@puttinucares.org.